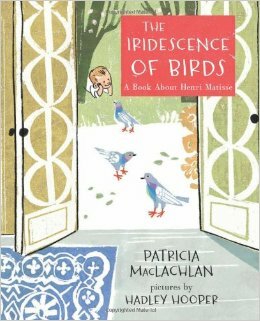 It’s killing me, it’s genius…Patricia MacLachlan wrote a perfect nonfiction picture book using only one sentence. Well, technically there’s two question marks, but still…The Iridescence of Birds is a biography of Henri Matisse that manages to convey most of his childhood environment, his relationship with his mother, his interests, his personality and how all that combined to create the adult artist and page by page the whole book is essentially one gorgeous sentence. MacLachlan also tells this story in second person, a technique not seen in too many nonfiction picture books and one that I’ve often heard that many editors don’t like and won’t buy for young readers. So let’s shout a big “Hurrah!” to Roaring Brook Press for ‘getting it’ and taking the chance on MacLachlan’s second person point of view. 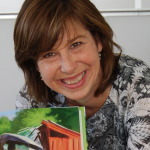 In terms of nonfiction or biography, I believe it’s an underused way to bring a child into a historical figure’s life and times because it helps the young reader to imagine living as the subject. For example the opening line of this book, “If you were a boy named Henri Matisse who lived in a dreary town in northern France where the skies were gray…” sets up a personal story so much more than the typical, “As a boy, Henri Matisse lived in a dreary town in northern France where the skies were gray.” Both perfectly good sentences, one works better at engagement. Ah yes, engagement…that imperfect, important art of getting your readers to love, like or at least keep reading your story. Studying how engaging your story is can only be done at emotional, psychological or physical distance. While you’re first drafting or even third drafting, you’re so engaged in telling the story that you can’t judge whether a reader will be too. Write like a reader…that’s the one sentence that sums up engagement. And that’s where taking the risk to let the story sit for a month, show it to a writing critique group, or as many brutally honest readers as you can find (not your family, for gosh sakes!) pays off. The most essential advice if you are really, truly trying to get a story published? Don’t take critiques as personal attacks. Critiques, even bad ones, even harsh, mean ones, will force you to think about story issues you can’t see. Critiques are like contact lenses for authors. And critiques from other writers and readers will prepare you for a professional editor’s comments which are like critiques pumped up on massive doses of steroids. Your story needs to live outside your heart, so let the comments fly and use each one to help you rewrite your work and publish your book. 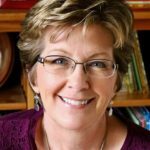 Barb Rosenstock, engagement, nonfiction, Patricia MacLachlan, picture books, writing advice. Bookmark. This sounds like an awesome picture book biography. And only in 1-2 sentences! I can’t wait to see that “technique.” Thanks for sharing! It’s really gorgeous Tina, I hope you read it! Yes! One of my favorite books of 2014! I need to get this one! Can't wait. Please do, it’s gorgeous! I forgot to mention great illustrations too! Wow . . . can’t wait to check this out! I can’t wait to read this, Barb, after you mentioned it at the picture book panel in Hyde Park. Keep sharing wonderful titles like these, please! It was nice to meet you Patricia and yes, it IS an impressive picture book! This post is so good, I’ve read it three times. I get so wrapped up in structure, I forget that what really matters is the connection to the reader. The advice “Your story needs to live outside your heart” is just what I need to hear. Sometimes, I really feel a story–but if readers don’t, they don’t and I need to do more work. I loved The Noisy Paintbox and can’t wait to read the rest of your work as well as The Iridescence of Birds. We all feel that way Charlotte, that’s why every writer needs some space (and some readers!) between the creation phase and the revision phase. Just requested it from my library – sounds fabulous! And your insight on perspective and critique? GOLD. I will be returning to this post many times. Thank you!